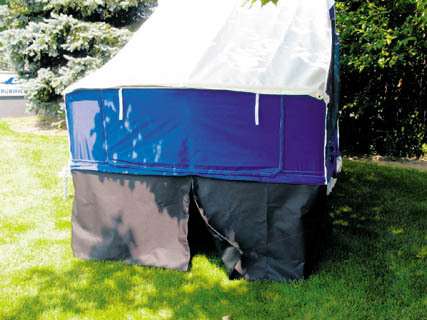 Made of black vinyl, the A/C duct kit allows you to create an opening in the wall of the tent which can be sealed off when not in use. 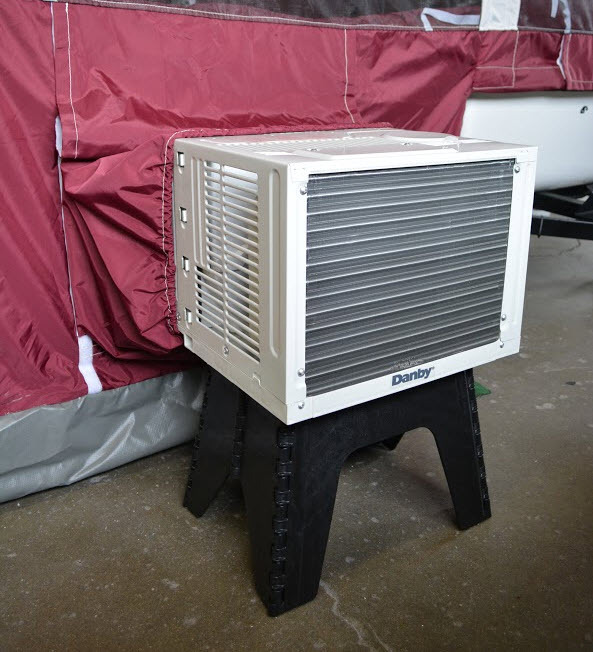 The A/C duct kit Velcro-mounts to the tent and drawstring cinches around the air conditioning unit. Made of black mesh, the Bed Caddy has (4) pockets and Velcro-mounts along the bedboard to provide handy storage at the foot of the camper bed. Window panel made of heavy-gauge 11 ft. wide clear vinyl that is interchangeable between either the right or left side of camper or can be cut down the center to create (2) panels (front and rear). Attaches to Velcro strip at roof line. 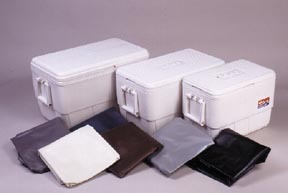 Made of the same sturdy vinyl as the travel cover, the cooler cover is available in Black, Charcoal, Silver, White and Navy. 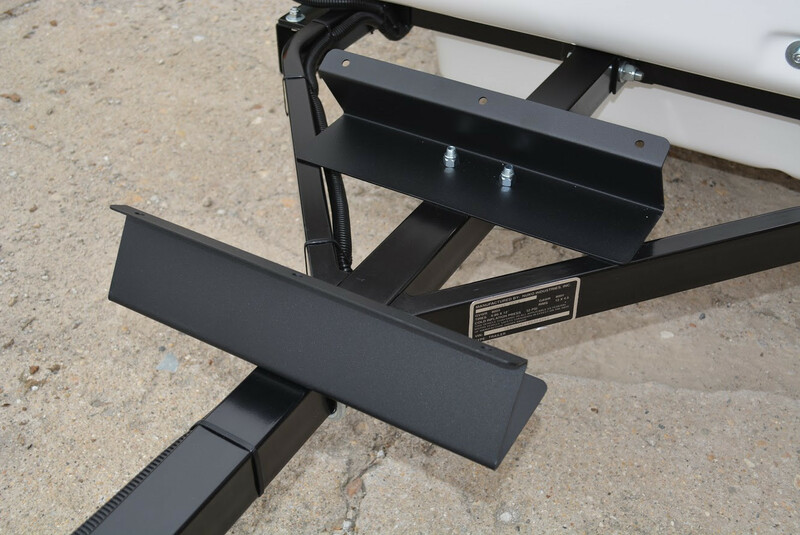 Z-fold black powder-coated rack mounts on the tongue and is adjustable to fit most any cooler. Cooler is secured with bungee cord tie-downs (not included). 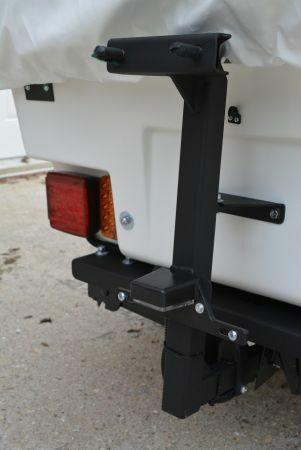 This zinc plated handle provides a non-slip grip directly behind the hitch. With (4) screened windows, the Den measures 5' x 6' (Classic) or 5' x 5' (Sentry) and adds 30 sq. feet (Classic) or 25 sq. feet (Sentry) of living area. The Den zips and Velcro-mounts to the front of your camper and includes tent poles, roof whips, ropes and stakes. It is available in blue, burgundy, green, silver, camo or orange tent nylon to complement your tent with a white tent nylon roof. The Den room is open on the bottom and does not have a floor. for wiring, tongue stand and lift handle. 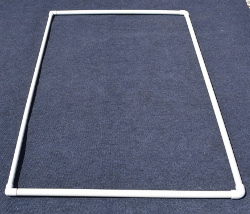 PVC tubing kit which when assembled provides a frame designed to stretch the Aspen's living area and may eliminate the need for staking. Creating a solid platform for secure sports gear, this rack can accommodate up to 2 kayaks or 2-3 bicycles. campers, we have a bolt on option. 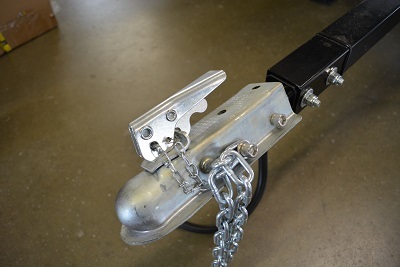 Both include a 66" tongue, additional jack stand (for tongue) and lift handle. Kayak saddles are not included. 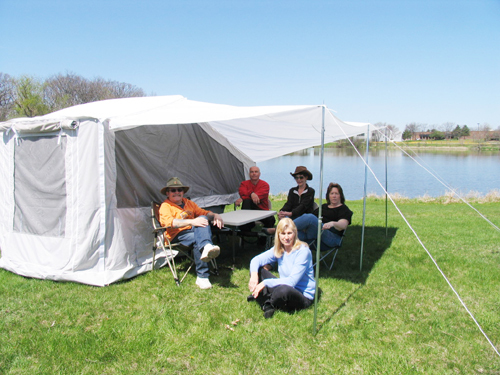 The Party Deck is made of white tent nylon and measures 90" x 158", It Velcro-mounts to either left or right side of the camper at roof line and includes 3 tent poles, ropes & stakes. The privacy skirt measures 28" high and 13' long. 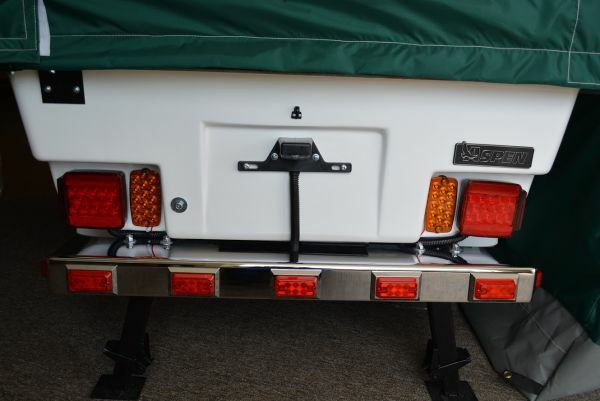 It is designed to mount below the outer bedboard to provide additional hidden storage while camping. 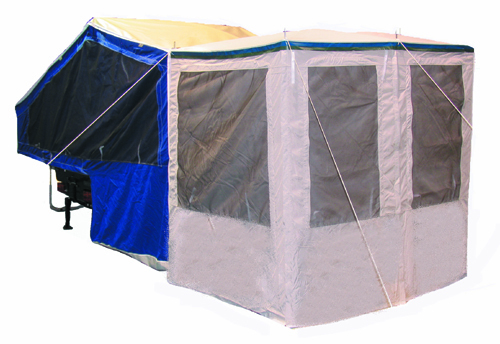 Made of white tent nylon (roof) and fiberglass light tan screening, the screen room measures 5' x 6' (Classic) or 5' x 5' (Sentry) and adds 30 sq. feet (Classic) or 25 sq. feet (Sentry) of living area. The Screen room zips and Velcro-mounts to the front of your camper and includes tent poles, roof whips, ropes and stakes. The Screen room is open on the bottom and does not have a floor. 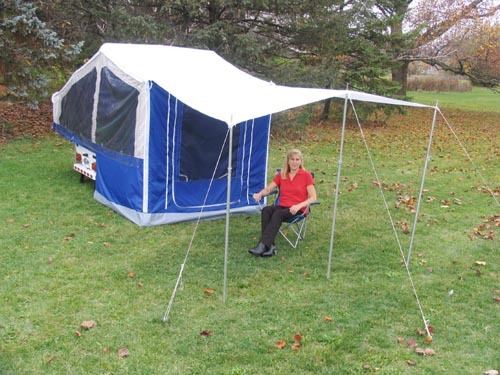 Made of white tent nylon, the sun-rain canopy is wedge-shaped and Velcro-mounts to the front of the camper to extend out 8'. It includes 3 tent poles, ropes and stakes. 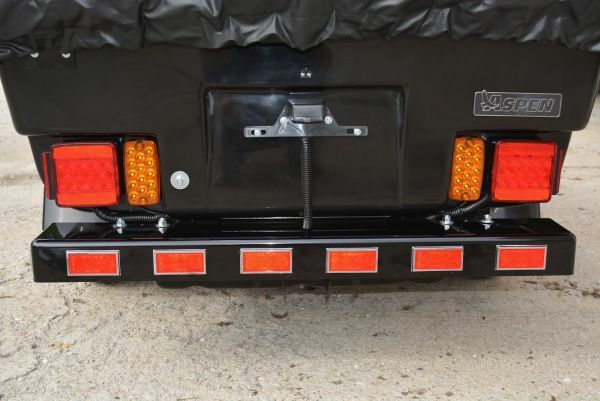 Allows 360 degree swivel of the trailer without affecting motorcycle leaning on turns. Made of aluminum and high-tensile steel rod, the coupler fits all 2-inch square tongues and standard 1-7/8" coupling. 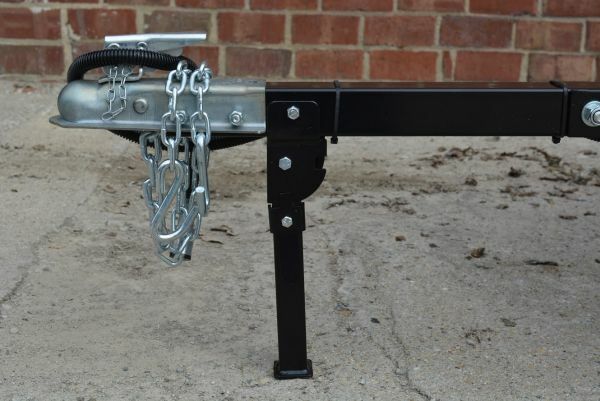 Single-leg, spring loaded stand that mounts on the tongue behind the coupler and provides stability if not using trailer jack stands. The tongue stand is black powder coated to match the frame. 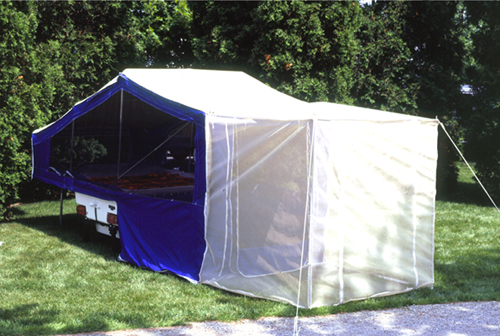 Now made of white vinyl, these side window awnings attach to the top 12" of the peak of the side windows and allow for air flow into the tent when it is raining. Includes (2) flexible whips.